In today's installment of Ridiculous Luxury: The Neiman Marcus limited-edition Swarovski Toaster. 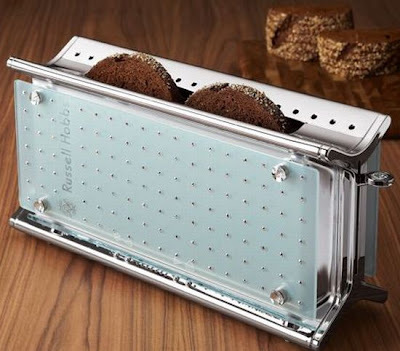 Designed by Russell Hobbs (just in case you missed his name surrounded by 200+ Swarovski crystals), this toaster is limited to 500 pieces and available for a clean $300. I'm sorry, but it only toasts 2 pieces at a time and I don't want to be a part of a conversation started by this. I imagine it to be like this: "Let me show you my bling toaster!" "That's pretty pimp, do you have a matching platinum blender or something?" "No, an Osterizer. Want to watch this toast some bread?" I prefer that my toaster have an attitude.